OBSERVER File Photo. Pictured above, is Tyler Mathis of North Collins during a game earlier this season. Mathis turned out a complete game for the Eagles on their way to victory. 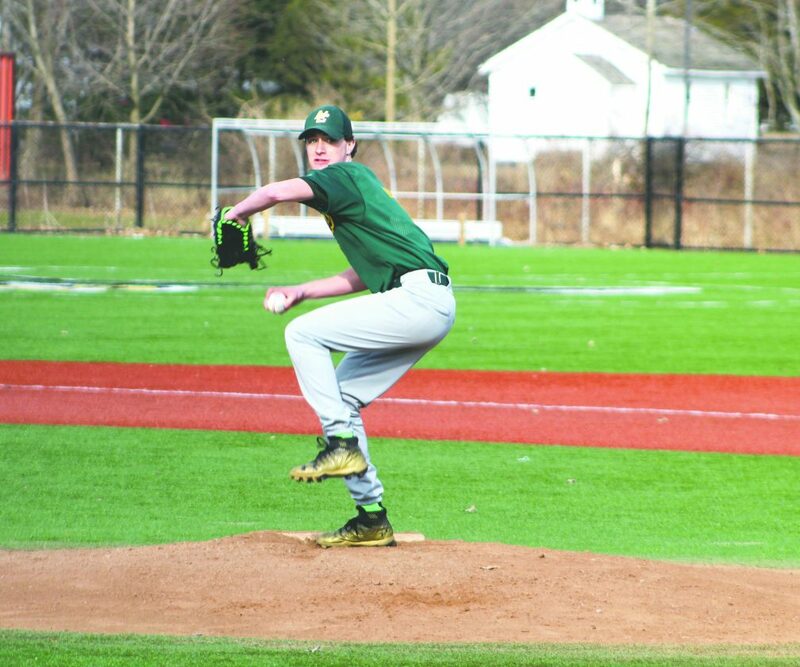 SOUTH DAYTON — The North Collins Eagles began their Section VI CCAA Division 2 East baseball game on Thursday night scoring multiple runs in the first and continued that momentum going into the second inning as the Eagles defeated the Pine Valley Panthers 17-1. The Eagles (1-1) were able to bat around in the first inning to take a four run lead. Christian Loretto led off with a walk, where brothers Jacob and Tony Puckhaber singled and walked, respectively. Tyler Mathis reached on an error where two runs scored. Later in the inning, Derek Overhoff singled in a run. Pine Valley was able to end the threat by turning a double play to conclude the inning. The Eagles continued reaching base in the second inning by erupting for nine runs. The first nine to reach the base were able to get on as a result of three errors and six walks. The lone hit of the nine run inning was an RBI single up the middle by Jacob Puckhaber. After a scoreless third inning, North Collins added another run in the fourth inning where Dominic Fricano led off with a single. He was eventually able to score from an error that was overthrown at first base. The Panthers (0-3) continued to fight hard during the game and were able to bring a run around the diamond in the sixth inning. Corey Ellis singled to get Pine Valley started, where Dustin Baldwin followed with another single. Pinch hitter Makiah Snyder came through with an RBI single to bring in Ellis. The Eagles added two more runs in the seventh inning highlighted by hits from the top of the order. David Gullo added a single before Loretto contributed with a two run double. Matt Cadle pitched for the first time for the Panthers and gave a great effort in defeat. “This was the first time that Matt was on the mound,” Buczek stated. “This was a great learning experience for him. He did a good job of putting us in positions to get outs, but we could not give him the support necessary.” Sam Hunt and Brendan Colvin pitched great in relief. North Collins was led offensively by Jacob and Tony Puckhaber, who both had a multiple hit game. Loretto also added a double with five runs batted in. Corey Ellis had the lone multiple hit game for the Panthers. Pine Valley looks for its first league win on Monday when they travel to Franklinville. North Collins hosts Springville in a non league game on Saturday afternoon.